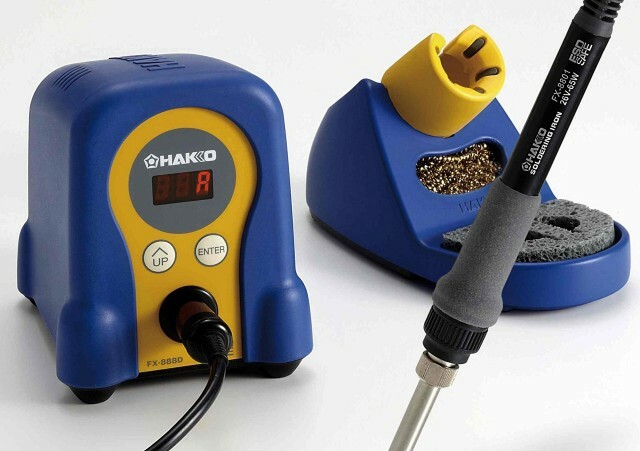 Once upon a time at the museum we found an old Hakko FX-888D soldering iron for Sam to use. He tried to solder things, but it did not work. 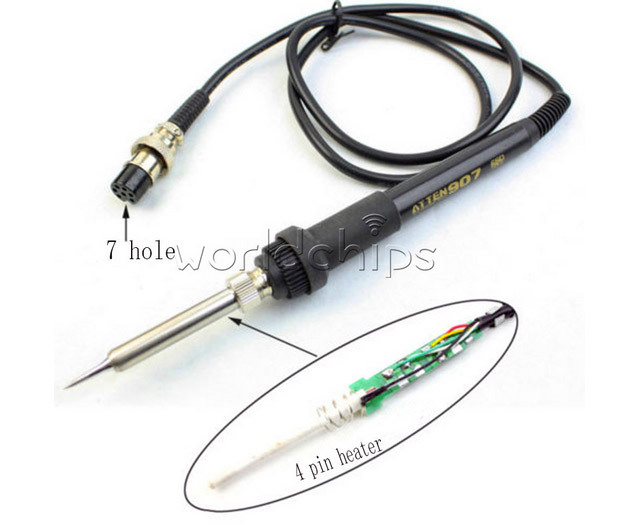 I tried soldering things with my Hakko FX-888D soldering iron and it worked great! I looked at his iron and declared it “not working properly” and then we stopped using that one. 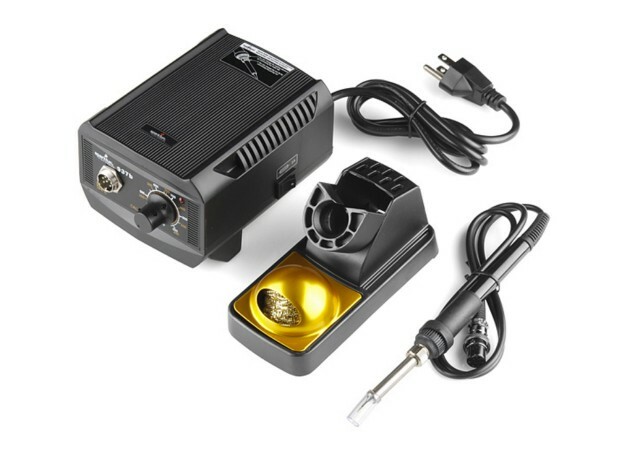 This week I tried using my Hakko FX-888D soldering iron and it just did not work. I ‘raised’ the temperature and it still didn’t work. Meanwhile, Becky soldered about a dozen buttons while I was still trying to do one. The solder would melt but not stick. Weird, and then I discovered that I probably managed to “adjust” the temperature instead of “change” the temperature. Yeah, confusing, right? This is (sort of) explained in the Hakko FX-888D soldering iron manual, very poorly, but start on page 5 and see if it makes sense. If not, watch this video. 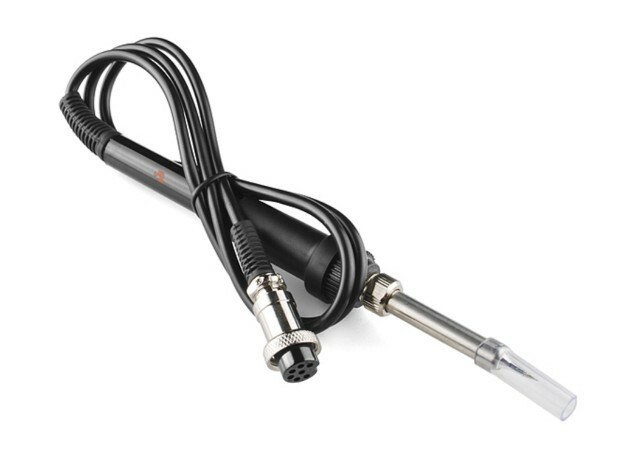 If you don’t want to watch the video, here’s the procedure for resetting the Hakko FX-888D soldering iron to the factory defaults, which totally fixed my problem of it not getting hot enough to make good solder joints. Your iron is now reset! I’m posting this here because future me will probably screw it up again, and then I’ll read this post and know how to fix it. Also, if Becky ever screws it up, she can look here too! 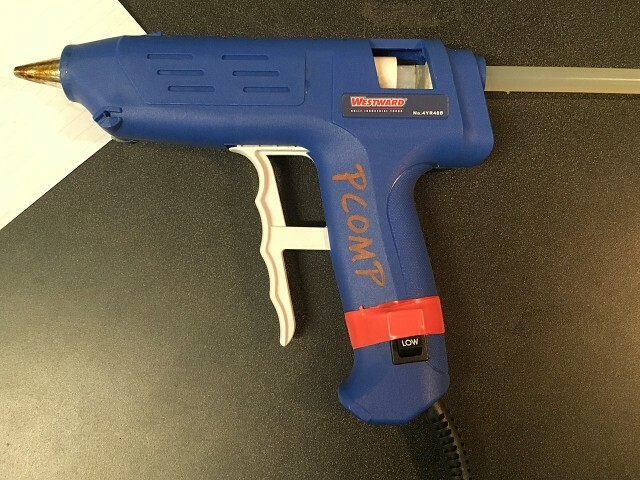 I spent some time after class in the Physical Computing Lab repairing the hot glue guns. During class students told me that the triggers didn’t seem to work, and they had to push the glue into the gun by hand to get anything out the hot-end. 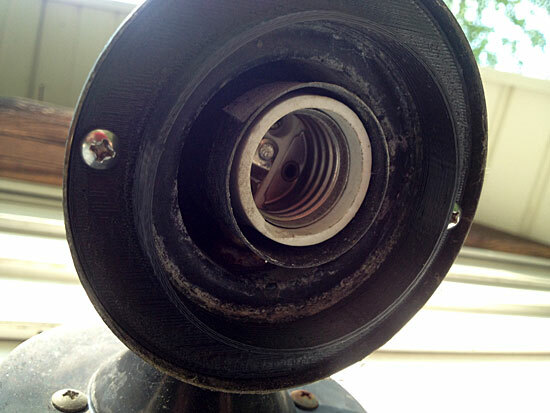 Two of the guns were in good condition, except for the snapped piece of plastic, but the third one must have been repaired before, because the rubber retaining ring and a tiny spring were missing, and the larger spring had been replaced by a not-quite correct replacement spring. The third one (once assembled) didn’t do a very good job of pushing the glue forward. I may have to try further repairs, but at least we have two working better now. 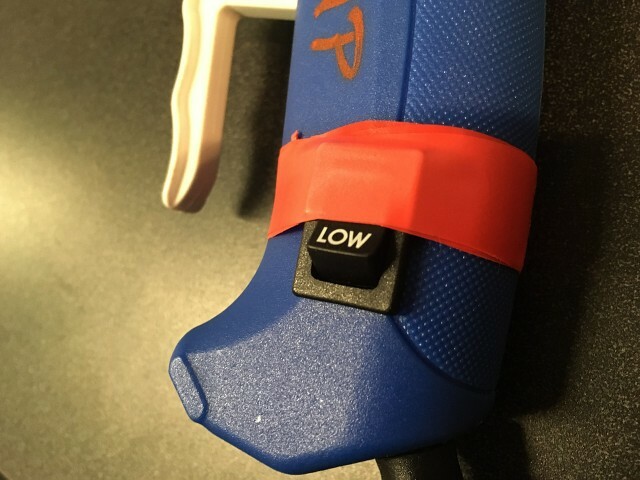 The other issue, which may have cause some of the problems, is a “HIGH/LOW” switch on the handle. When I held the gun, I ended up switching it to LOW. 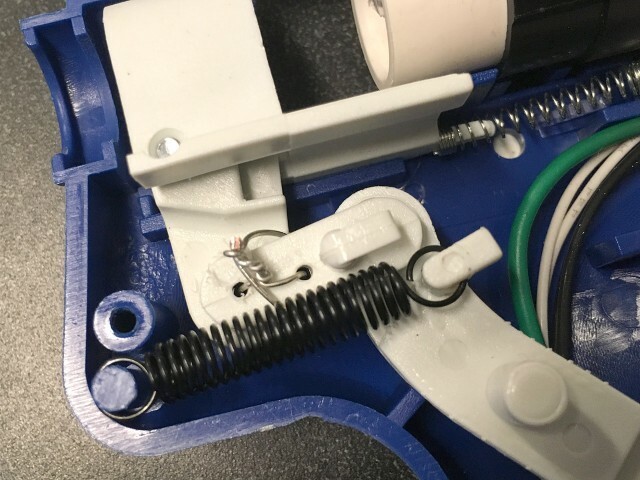 If someone had been using it on HIGH and accidentally switched it to LOW, they might have kept pressing hard on the trigger while the temperature dropped, and snapped the plastic bit inside. 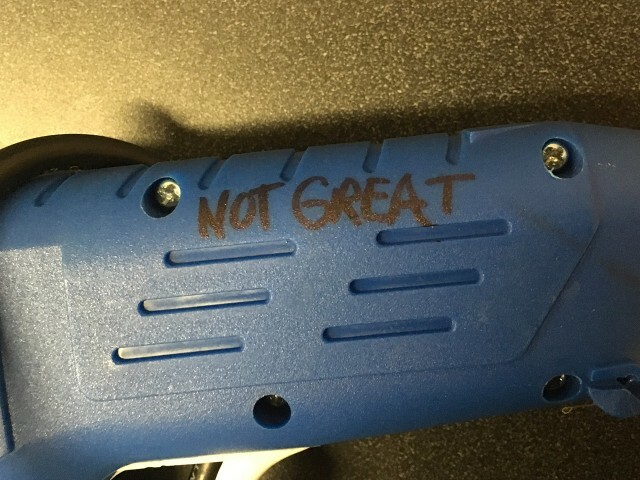 The third gun, which doesn’t work very well, got labeled “Not Great” so we remember which one is the crappy one., which can still be used, as long as you don’t mind (possibly) pushing the glue forward with your hand. 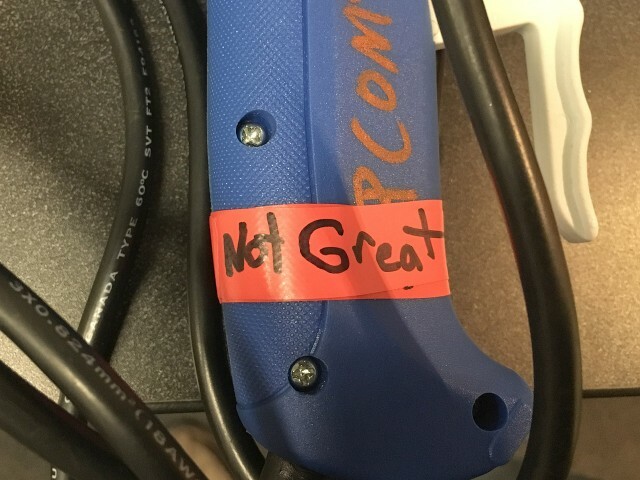 Reminder: Hot Glue is Hot! Since we move into our house nearly 18 months ago we’ve been dealing with the super-annoying “sometimes it works” garage door opener. 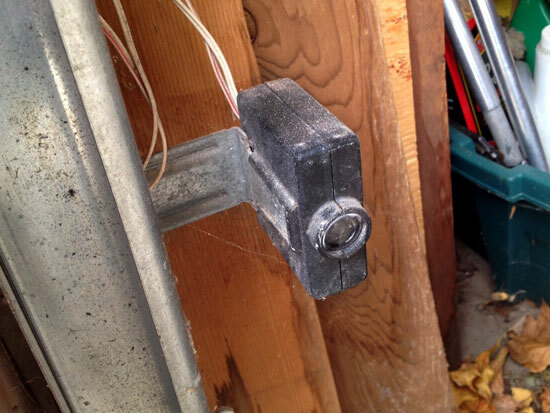 Or perhaps “garage door closer” is more accurate. In the olden days garage doors just closed, and if you got crushed it was your own damn fault. 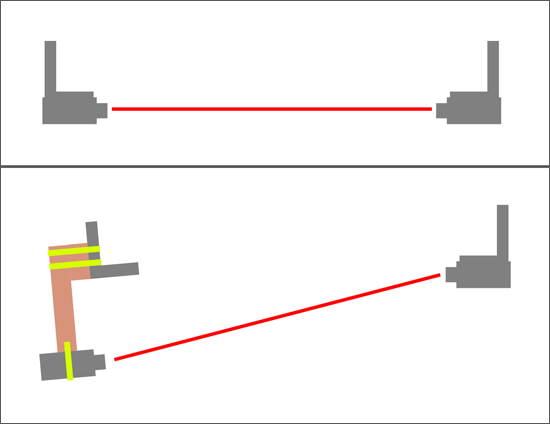 Somewhere along the way (in the name of “safety”) manufacturers added “External Entrapment Protection Systems”, which are typically an infrared emitter and an electric eye that sees the beam from the emitter. When the beam is interrupted (like when a stupid child runs under the closing garage door) the door reverses and does not close. No child crushed, no harsh lessons in being careless learned. Supposedly you can added some tubes, but I never got around to that. The garage not closing when you leave is just annoying enough to aggravate you, but not annoying enough to spend real time trying to fix it. 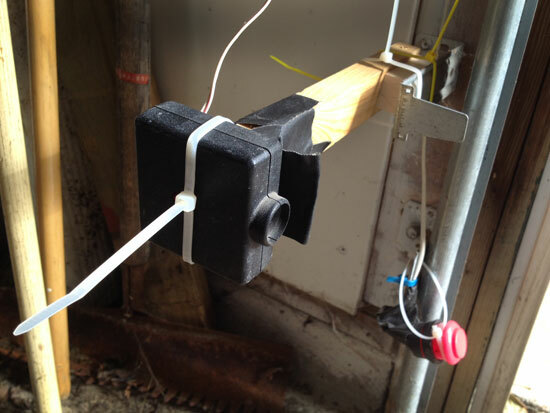 The new solution (which is working well so far) involves extending the electric eye a bit further in from the door, and angling it to point at the emitter. Some scrap wood and zip ties pulls it all together quite nicely. Here’s our new set-up. Granted, there is a bit more room where something could get crushed, but it probably won’t be me, because now I don’t need to stand Centimeters from the door as it’s closing. I (somewhat) jokingly posted something the other day about how my wife asked me to 3D print something, and was totally serious this time and not sarcastic about it. To be fair, she’s heard me say “I’ll just 3D print one!” about 100 times this summer, and was probably sick of it, but when you live in the future, it’s pretty damn exciting. Or story begins back in 2009 when we moved into our current house. The light above the front door was just a bare bulb, with nothing around it. I’m assuming there was a glass ball at one point, and it must have broke, or been stolen, or dematerialized. No matter, we can fix it. 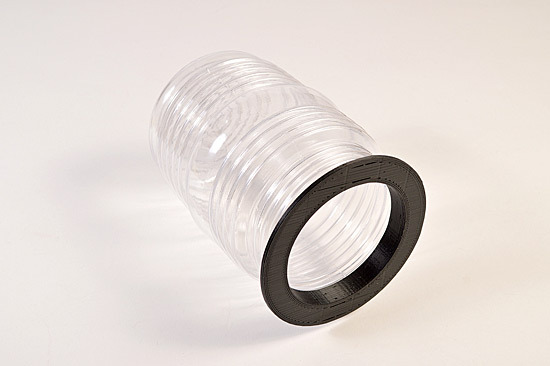 While at Home Depot the wife found a cheapie plastic majigger that would fit over the light bulb, so we bought it. This is also when she suggested I could “make it work” and thus, I agreed. 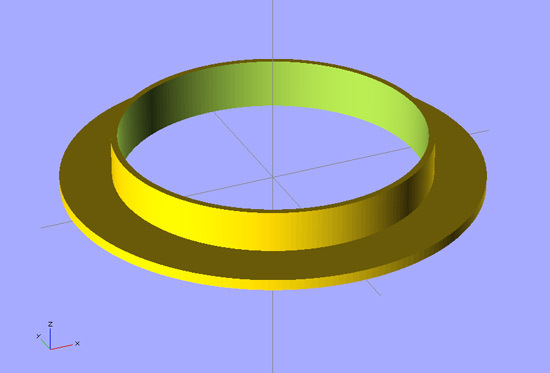 I ended up using OpenSCAD to design a simple ring that would press-fit the new piece, and have the needed holes to fix the fixture… and adapter, if you will. Here’s the piece after I drilled the holes and secure it into the fixture with two small bolts. Sadly the small bolts are a little long, and stick out the top, but hey, it’s still an improvement. 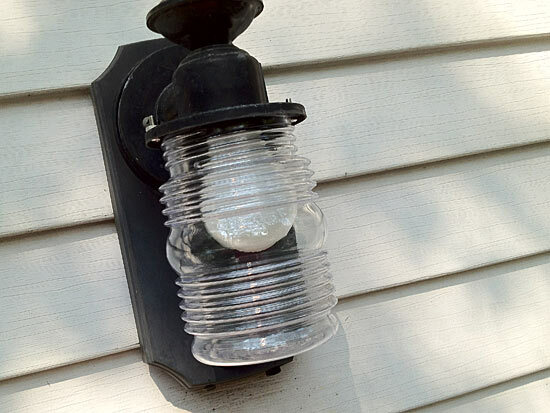 So now on the front of the house is this lovely cheapie plastic majigger instead of just a bare light bulb. Home Improvements FTW! 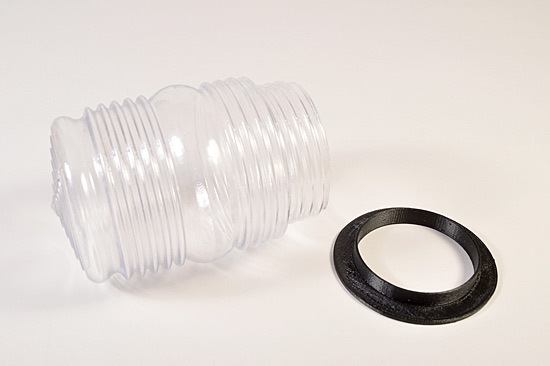 This is one more thing where I really don’t know how I could have done this as elegantly without a 3D printer. 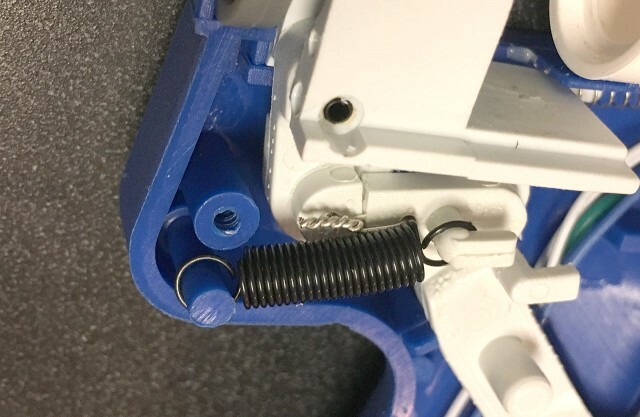 Using open source software I designed the needed adapter and then printed it out using open source hardware, and the total cost of materials (ABS plastic) was probably less than 50 cents. As I said… living in the future and all that.